One tradition within many Catholic families is a devotional shrine in the home. The main focal point should begin with a crucifix or a depiction of Christ. Pictures of saints and statues can also be placed in the shrine. The Bible may also be present as it is a place around which people may gather for a Bible reading or to offer prayer. 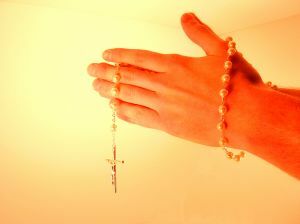 Rosaries, Miraculous Medals, Holy Water, and Scapulars are also beautiful additions to increase devotion. Flowers can also be used to honor the joy or sorrow of the liturgy throughout the year. Candles also make the shrine area special, just be sure to never leave a lit candle unattended. Lighting and extinguishing a candle also help signal when evening prayer begins and ends.